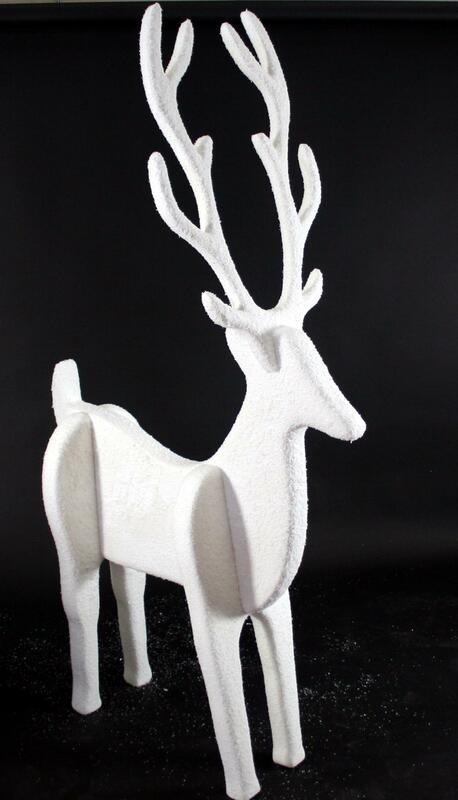 We have a range of Polystyrene reindeer, including; from 2D and semi 3D, Standing & flying pose designs. They look as a great as heard in a winter scene or standing solo. 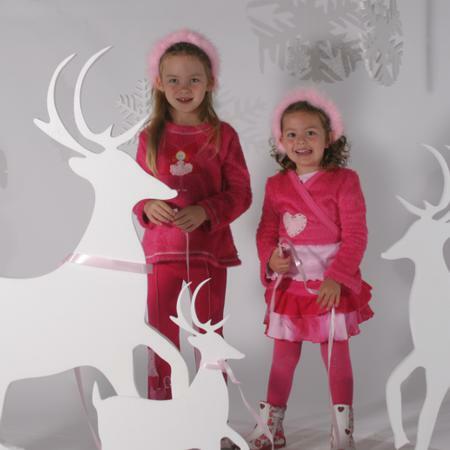 These reindeer are ideally suited for window displays, but can also work in-store or for event theming. 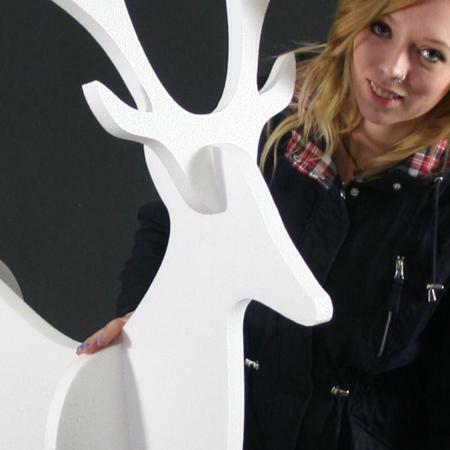 Our reindeer are designed and manufactured at our studios in the UK. We have 4 designs as standard, but can also work to custom artwork. 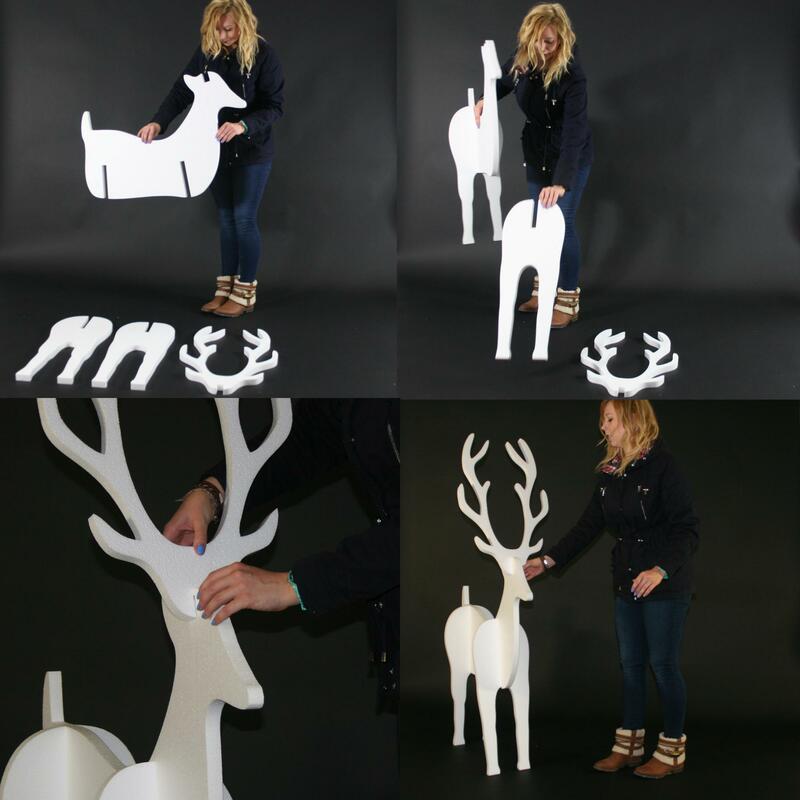 These semi 3d reindeer can come Flat packed, which are great for small storage spaces. They construct in four easy steps, the pieces slot nicely together and hold as one without the aid of any adhesive. These are available from 280 mm high to over 2000mm. 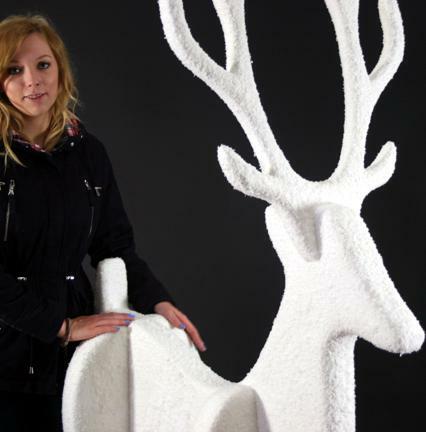 2D Polystyrene reindeer are available from 140 mm to 1145 mm high. 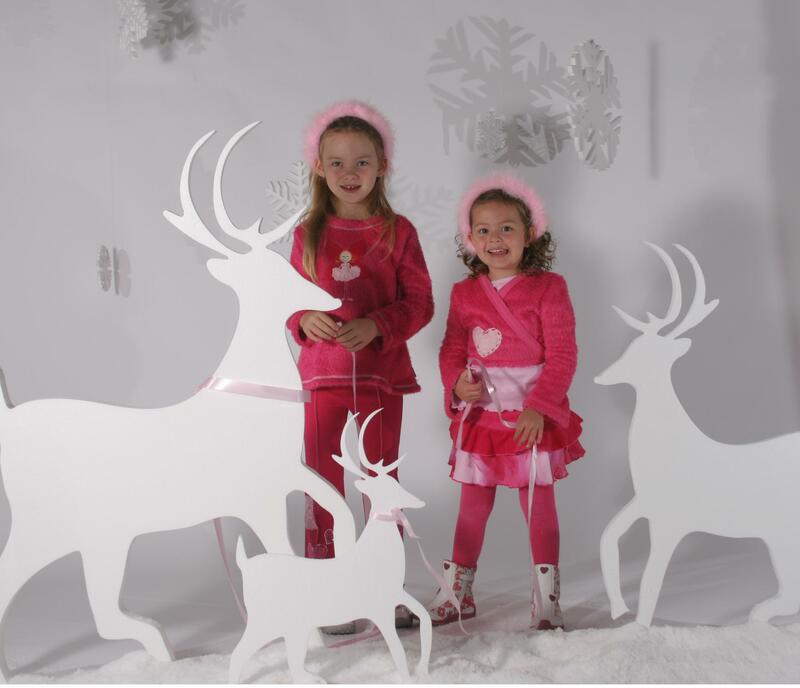 These reindeer are in a standing pose, but they are 2d cut outs and will not stand up on their own. They look great as a back drop for a window display. 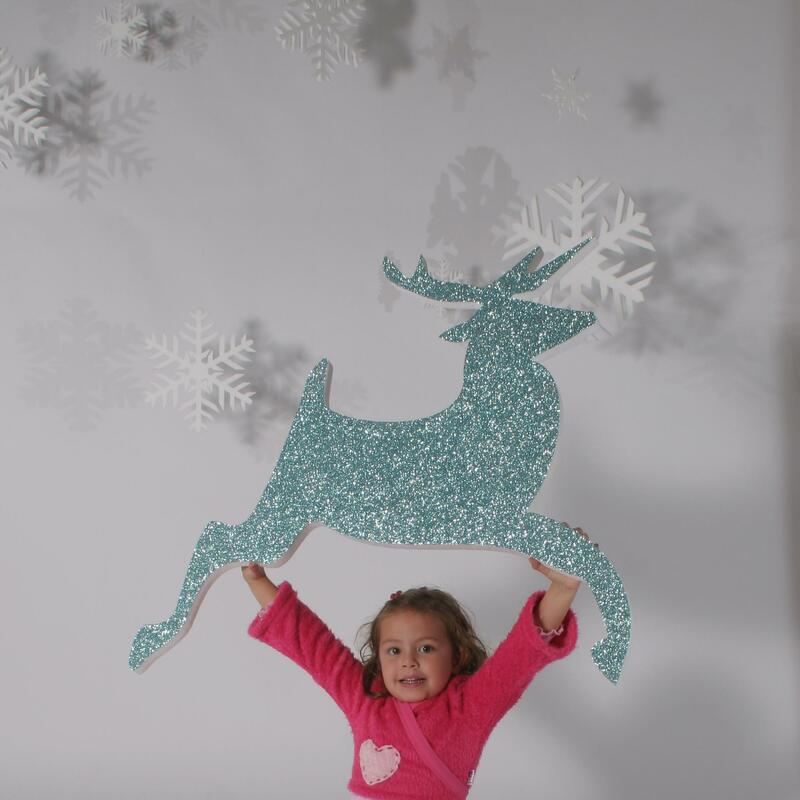 These semi 3d flying reindeer are great for high up displays. 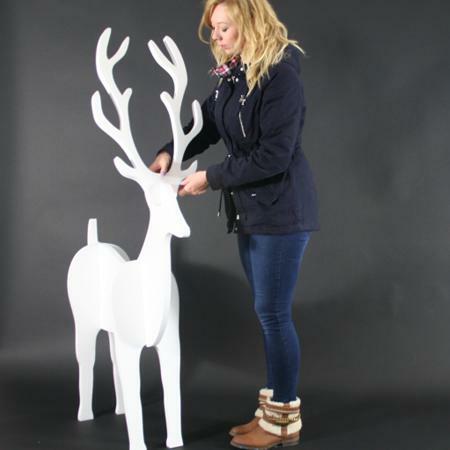 They can all be fitted with secure hanging points, and the antlers can be supplied separately for assembly just before you display them. We have 3 variations of this design from a basic 2d body with antlers at 90 degrees, to a more sculpted look. 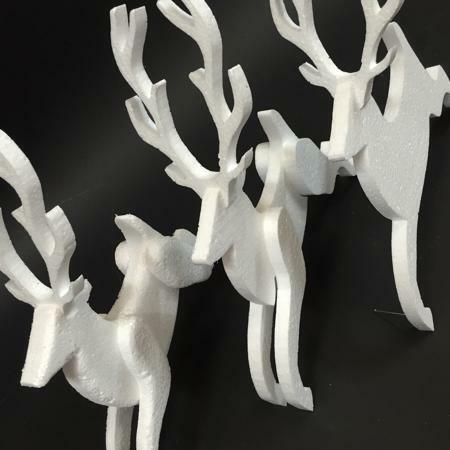 These 2d flying reindeer can make a very cost effective display, either high up suspended from the ceiling, or as a backing for a Christmas window. These are availalbe from 140 mm to 1145 mm. These can all be fitted with hanging points, and custom designs are available. 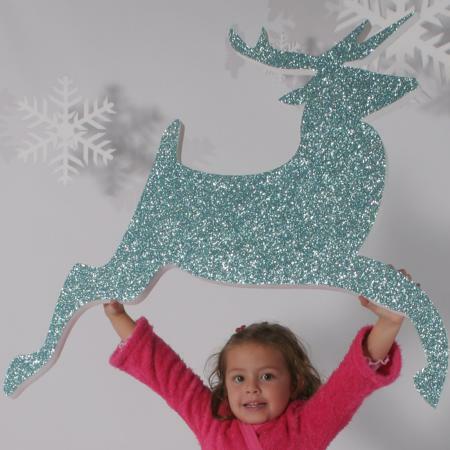 Our reindeer are available in a variety of finishes. The cost effective option of plain polystyrene give a very sleek modern look to a display. 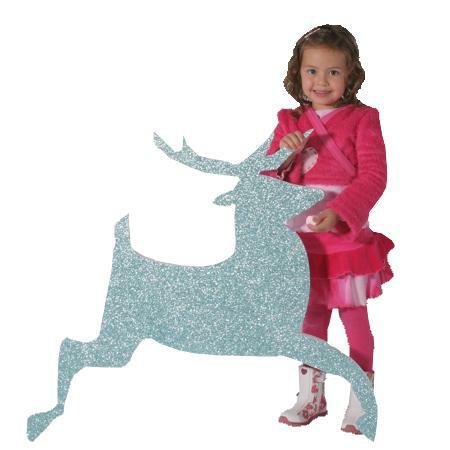 Other finishes include snow effect, glittered to any colour of your choice, or a mix and match of different coloured antlers. 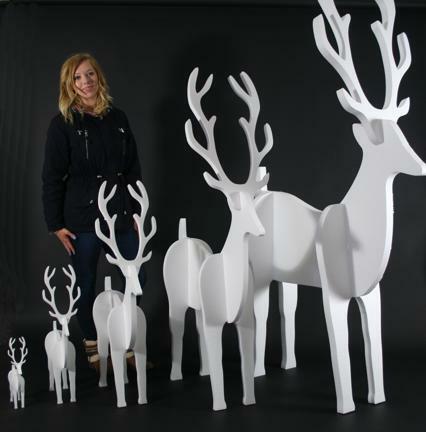 Our range of Christmas reindeer are all designed, developed and manufactured at our studios in the UK. We use good quality - display grade expanded polystyrene containing a flame retarding additive. When we apply glitter and snow finishes we do not use a flammable adhesive - instead we have sourced a special coating which increases the products resistance to fire -as well as offering good adhesion for the glitter and snow. 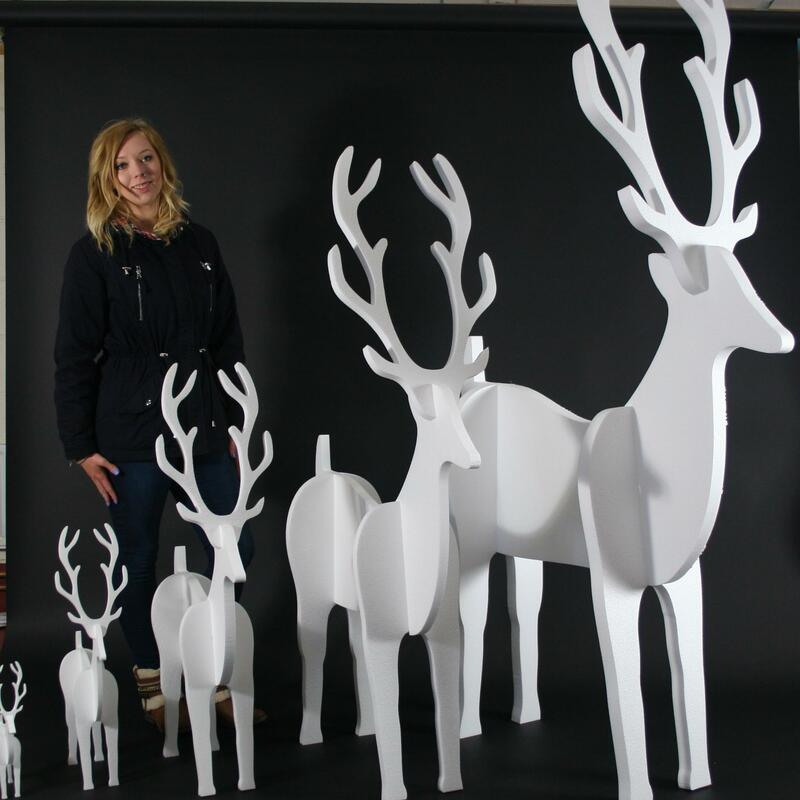 Our standing and flying reindeer are available in a range of different sizes from 140 mm to over 2100 mm, so can fit nearly any display. If you are looking for something larger, or a little different - please give the studio a call to see what we can do to help. All styles of reindeer can be fitted with secure hanging points. If you wish to have hanging points fitted with your reindeer then please specify this when ordering.